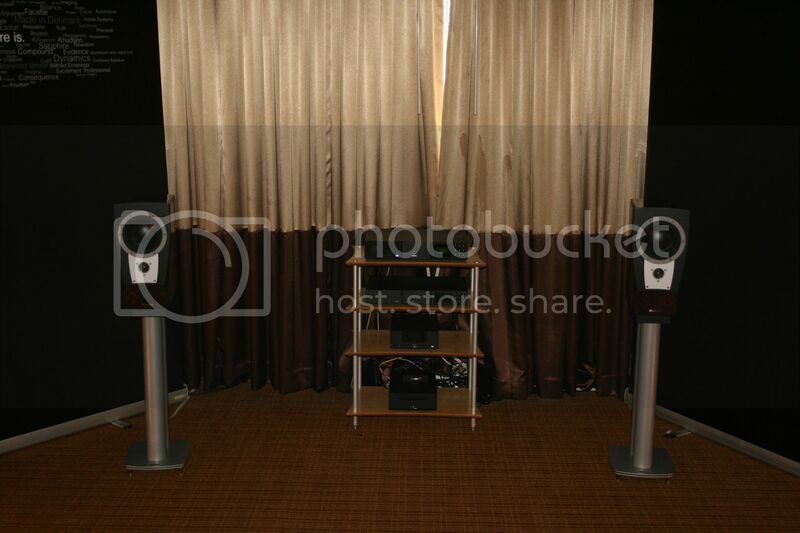 All of the equipment in both rooms was from Naim Audio from their XS line - unfortunately, they did not provide specifics as to what was in use and the room was too busy to have one of the exhibitors run down the list. 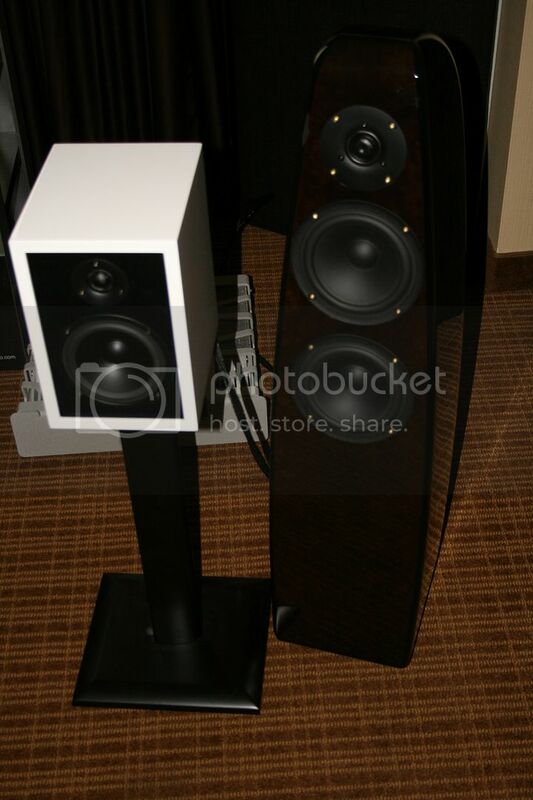 The Dynaudio Confidence C2 (MSRP $15,000) uses two Esotar tweeters and two mid/bass drivers with Kapton voice coil formers. It employs Dynaudio Directivity Control (DDC) which uses symmetrical dual drive units, optimized driver positioning, and advanced crossover design to reduce reflections by up to 75%. 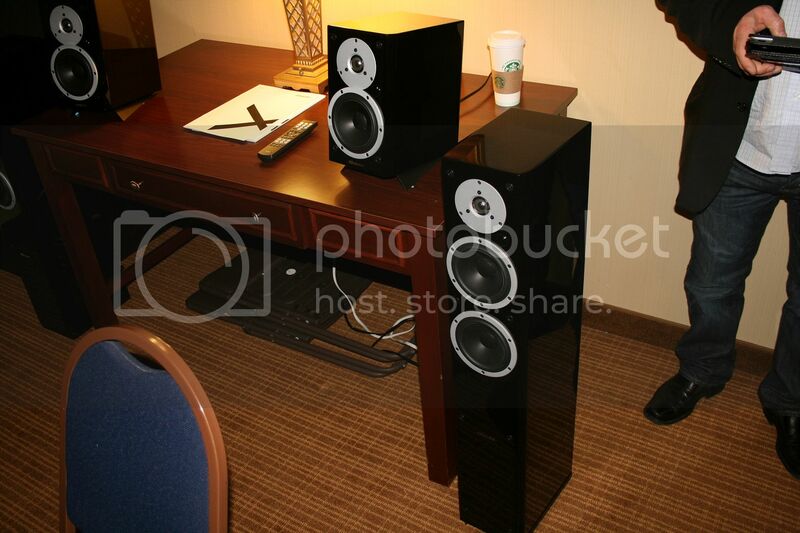 The C2 has a stated FR of 28 Hz - 25,000 Hz with a sensitivity of 87 db and weighs 88 lbs each. The Dynaudio Confidence C1 (MSRP $8,500 for this finish) uses one Esotar tweeter and one mid/bass driver with Kapton voice coil former. 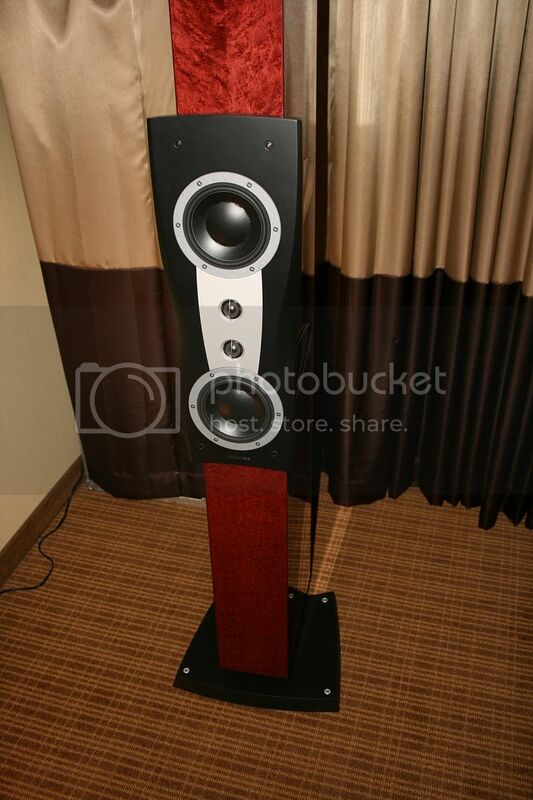 The C1 has a stated FR of 45 Hz - 22,000 Hz with a sensitivity of 85 db and weighs 24 lbs each. The C2 has the standard rectangle shape, but they did a great job of breaking it up with the design of the front baffle. 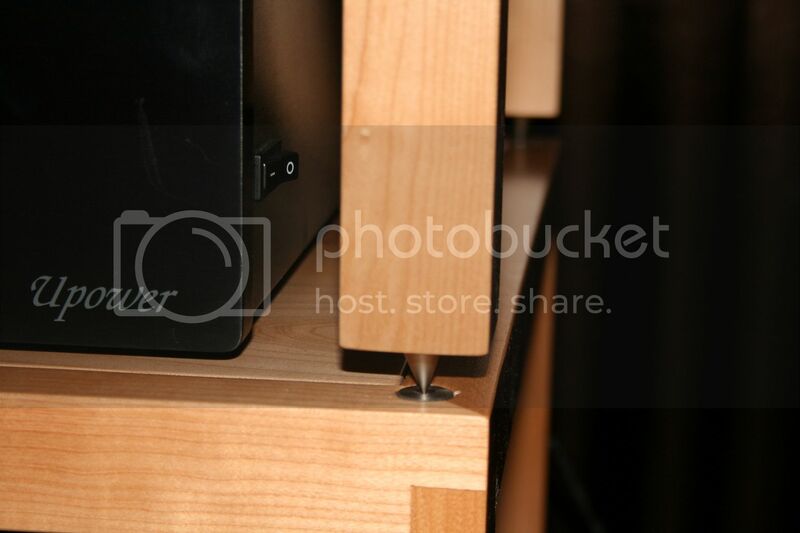 The finish of the cabinet really helped the front baffle stand out to further break up the standard shape. 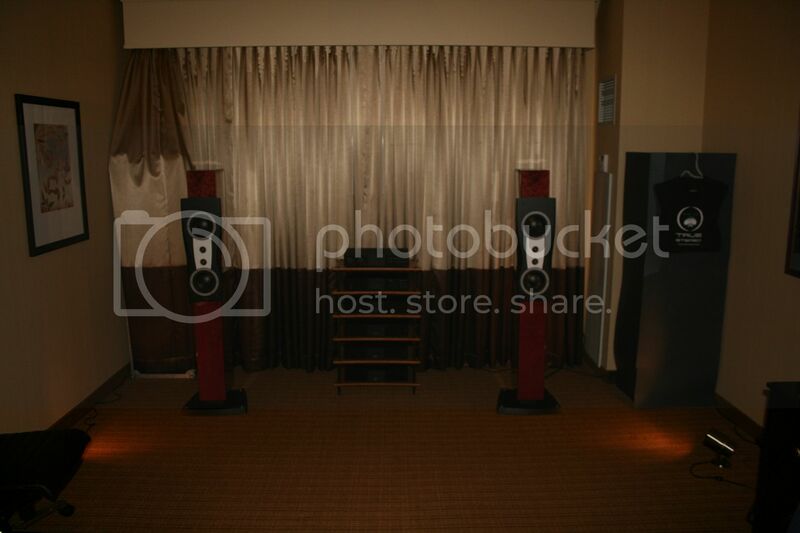 They imaged very well and had great dynamic range. The clarity was fantastic - hearing every pluck of the string really is a treat everyone should experience! Low end was good - not overly impactful, but very clean. The C1 has a very ordinary appearance - the finish was good, but nothing really jumped out at me from an aesthetical point of view. 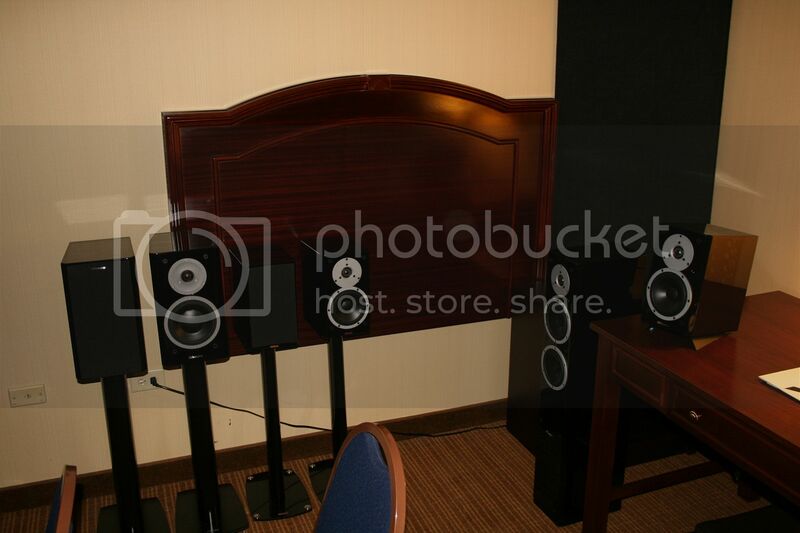 This was another of those monitors that had a bigger sound than its size, and it had good dynamic range for a monitor. Clarity was very similar to the C2 - details were very prevalent. Midrange was good, but lacked the punch I enjoy and I could hear them struggling with some of the low end passages - there was a very definitive audible buzz. I definitely had better experiences with other monitors that cost far less. Corner treatment was used in both rooms. Next up was one of the two rooms for Colleen Cardas Imports. 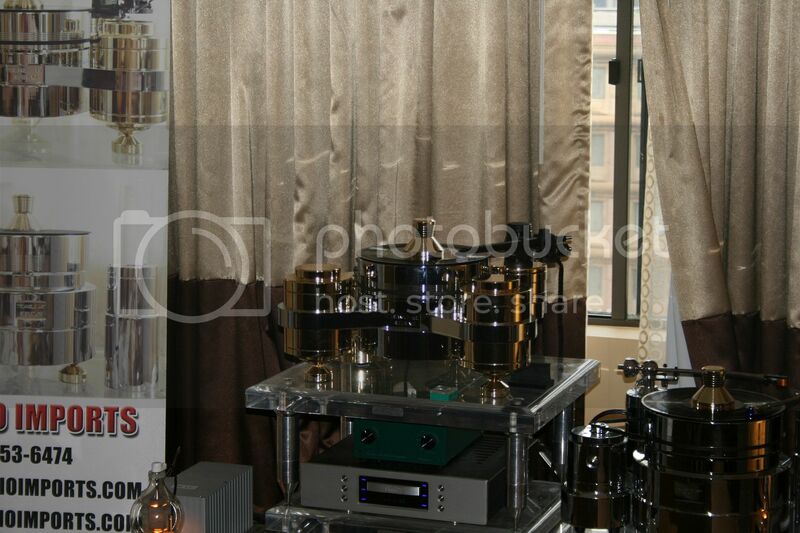 Pure Audio is a New Zealand based company - all three of their current products were in use in this room. 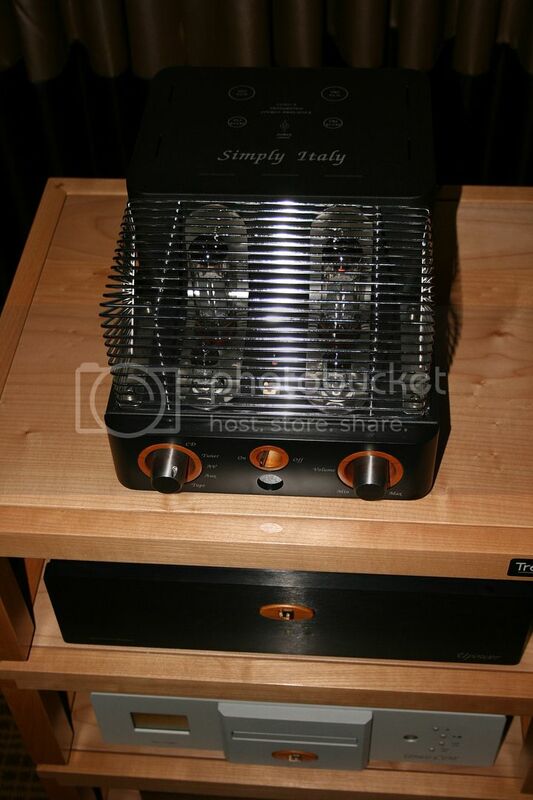 The Reference amplifier is a Class A monoblock that provides 65W RMS with a stated gain of 28 db and weighs 35 lbs. The look was rather unique - the case appears to have been designed to allow heat to dissipate through all sides. 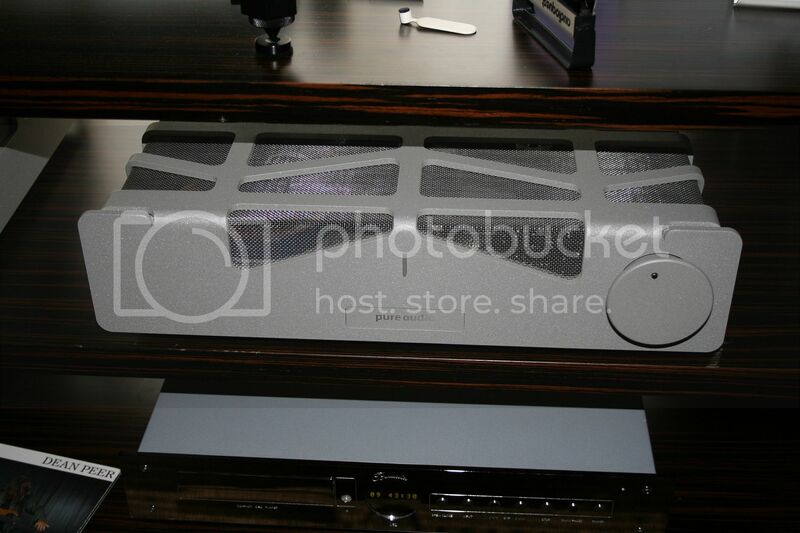 The case is a rather plain gray - I would have loved to see what it looked like in black. My Audio Design (MAD) is a UK-based speaker company. Two of its speakers were in this room - the 1920S and the Duke Royal Limited. 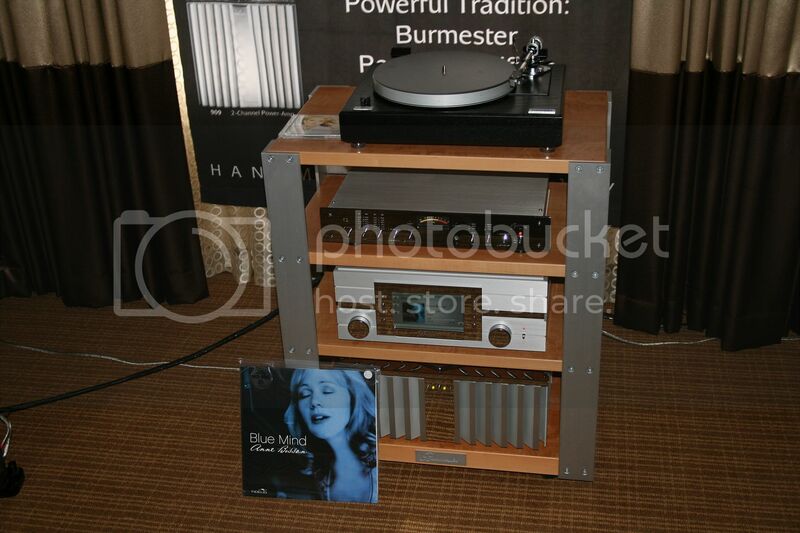 The 1920S uses a MAD SDC ultra precision mid/bass driver and a Neodymium supersonic tweeter. It has a stated FR of 55 Hz - 40,000 Hz with a sensitivity of 90 db. The Duke Royal Limited uses one MAD supercharged ring radiator tweeter and two MAD soft doped fabric mid/bass woofers. 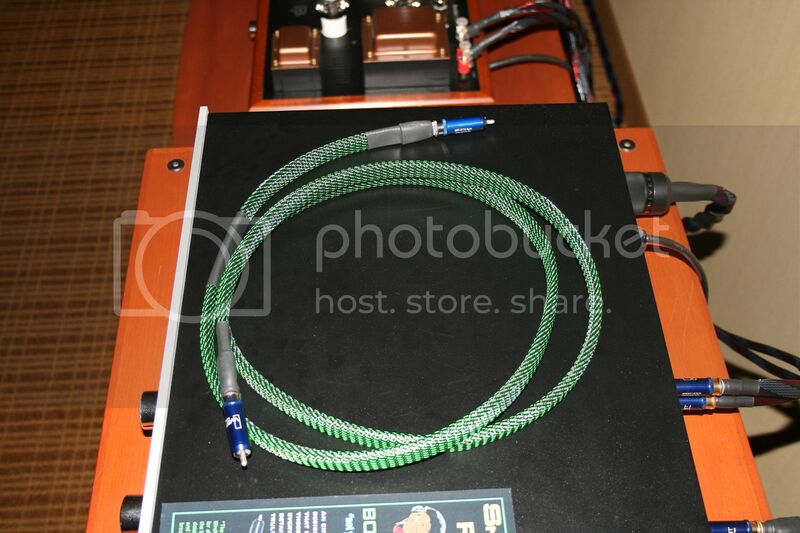 It has a stated FR of 38 Hz - 40,000 Hz with a sensitivity of 93 db. 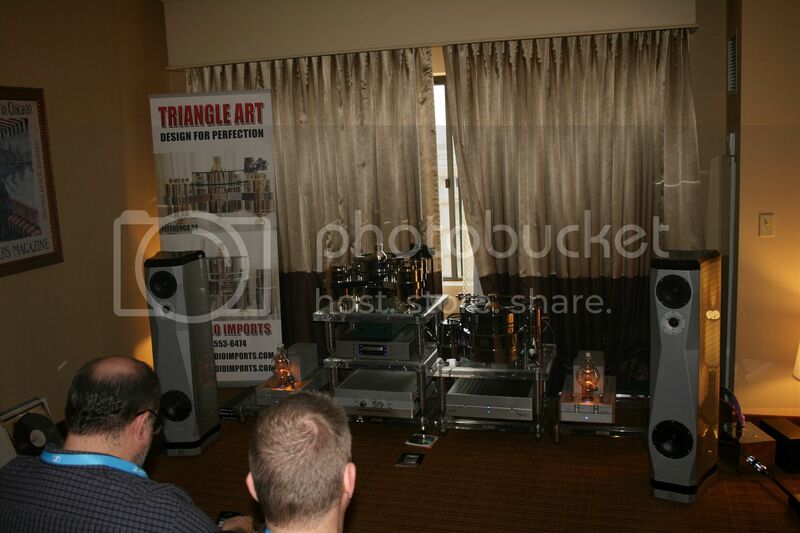 Sadly, the Duke Royal Limiteds were not playing when I entered the room - I would have loved to hear them. The finish on the Dukes was stunning - they had a very dark finish, but that was not what made them stand out. 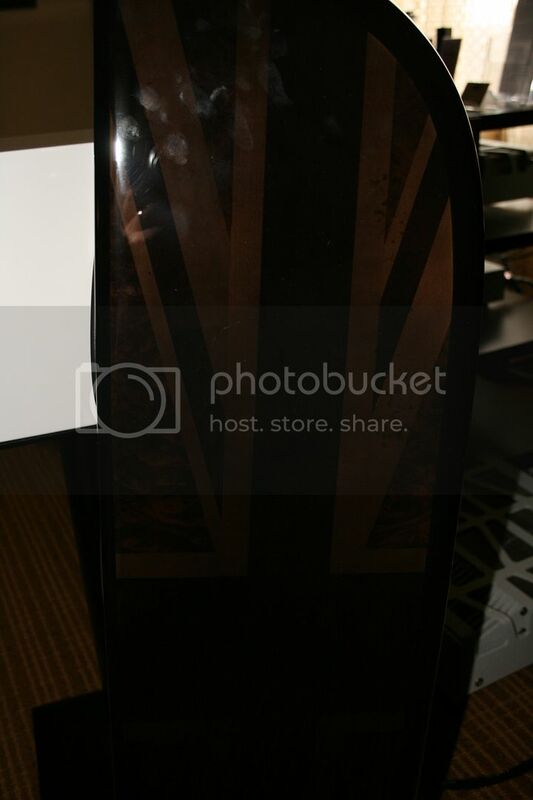 It was the inlaid British flag on the side that just made me go "Wow!". That finish adds $18,000 to the speaker as it takes an additional month to build as each pattern in the flag needs a different wood to pull off the effect. It is not as visible in the US-made version, but can be seen under light. 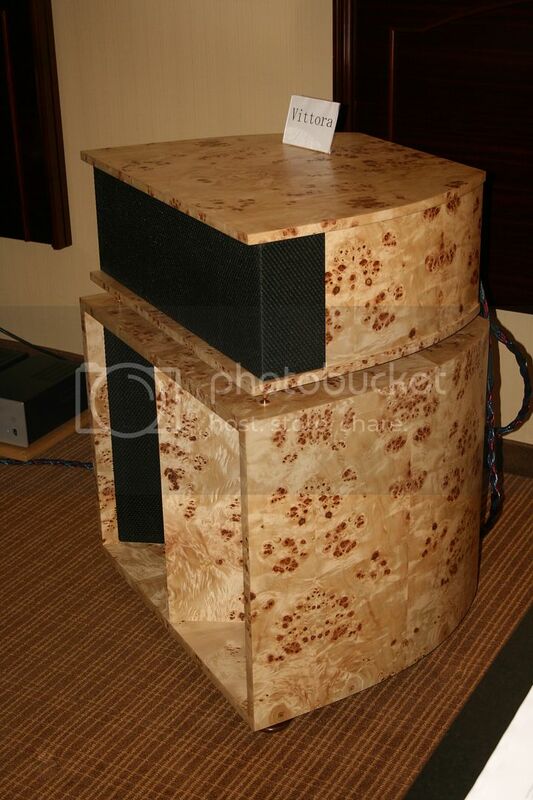 The 1920S had the piano white finish - there really was nothing that stood out about the look of this speaker. 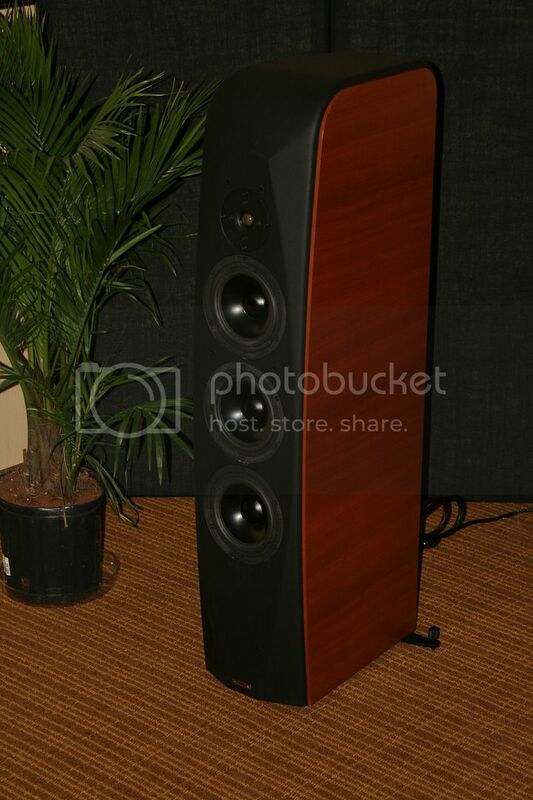 This was one of the few bookshelf / monitor speakers at the show that sounded how it looked - small. They did image well from the sweet spot, but moving from that spot showed a somewhat narrow soundstage. Clarity was OK, but I really felt I was missing a lot of detail - low end had no real presence to speak of - and when an orchestral track came on, the horn section made me tense up. I just did not feel relaxed while listening to these - unfortunately, I did not make it back to see if they had swapped to the Dukes. Corner traps were used in this room. Colleen Cardas Imports had a second room as well that I visited on Sunday early afternoon. Unison Research is an Italy-based company founded in 1987. The Simply Italy integrated amp is a Class A amp with two EL34 valves and two ECC82 valves that delivers 12 wpc and comes with a remote. The Unico Upower booster amp is a Class A booster amp designed for use with low-powered tube amps and can quadruple power up to 100 wpc. The Unico CDE CD player has a hybrid design with four ECC83 valves, 24 bit/96 kHz conversion, and also includes a remote. The unit in use for this system came with the dual-mono optical DAC upgrade. 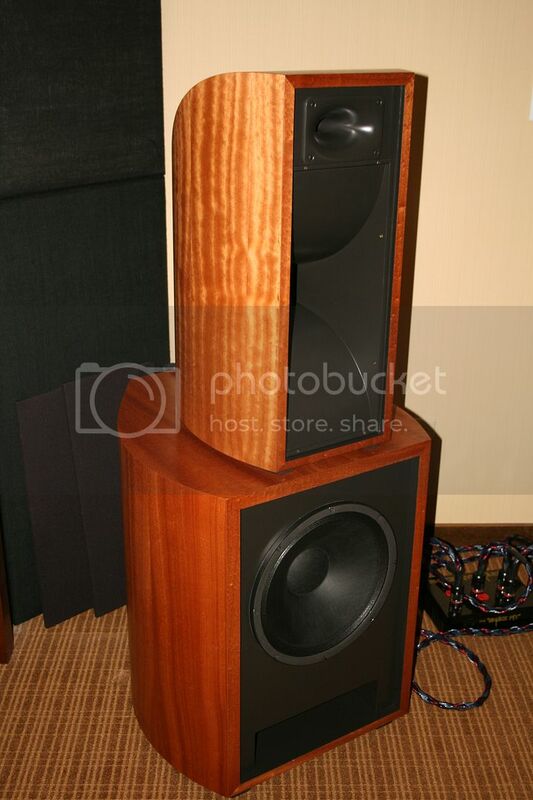 Opera Loudspeakers was started in 1989 by two gentlemen - one Italian and the other English. The Opera speakers mold an old-world Italian craftmanship in cabinet making with more modern acoustical technology. The Quinta uses two 6.5” Aluminium cone woofers, one 6.5” Aluminium cone midrange, and one 1” Scanspeak D26 tweeter in a sealed box cabinet. 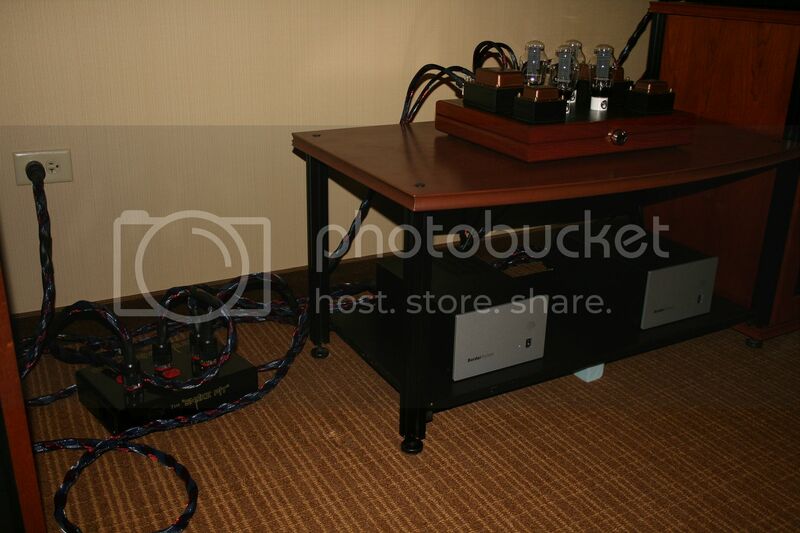 It has a stated FR of 30 Hz - 30,000 Hz with a sensitivity of 89 db and weighs 112 lbs. The available finishes are piano black, piano white, cherry, and mahogany - the show set was in cherry. Corner traps and plants were used for room treatment. I really like the design of the cabinet on this speaker - the front of the cabinet has a curved face that really gives the speaker some personality. The black on the face is in actuality a leather wrap and the combination of it with the cherry finish really made both stand out. The Quintas imaged superbly - they just completely disappeared and allowed me to really focus in on the sound. The first thing that really stood out was a track that used bongos - it really accentuated the crisp, punchy mids. Clarity was excellent as well - every instrument could be heard, even during vocal tracks. 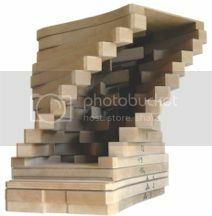 Last, I really liked the design of the rack - the decoupling method used was extremely well done. 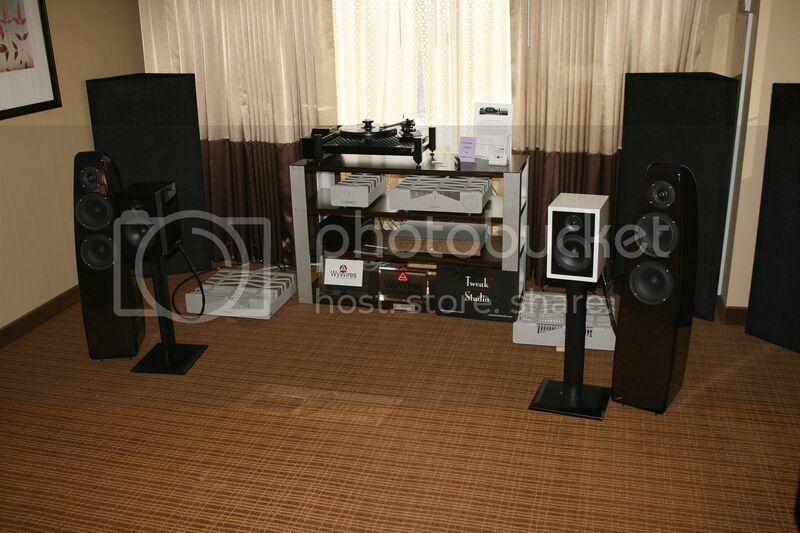 Next up - the KT Audio Imports room. 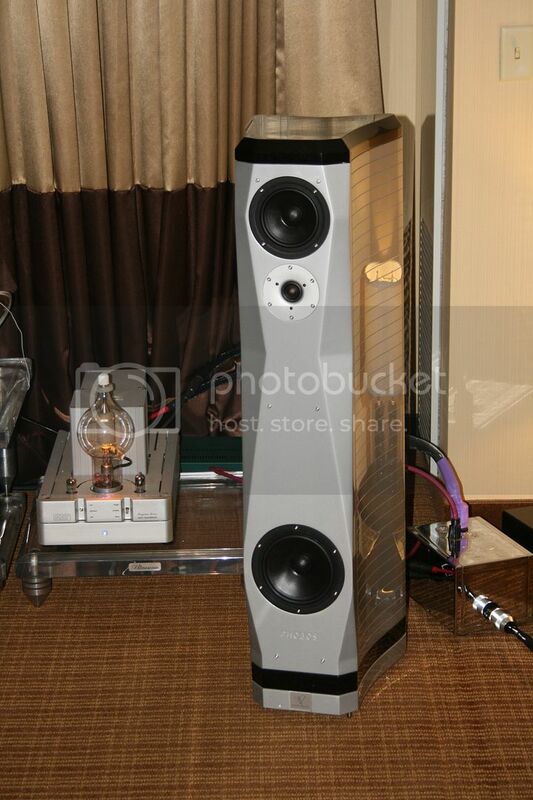 Eventus Audio is an Italy-based company that was started in 2000. The Phobos speaker uses the patented SACC (Simulated Anechoic Cabinet Construction) technology to make the cabinet as neutral as possible to remove the opportunity to add to the original music score. The speaker uses a 7" VIFA high excursion woofer, a 5" VIFA polypropylene midrange, and a 1" Scanspeak tweeter. 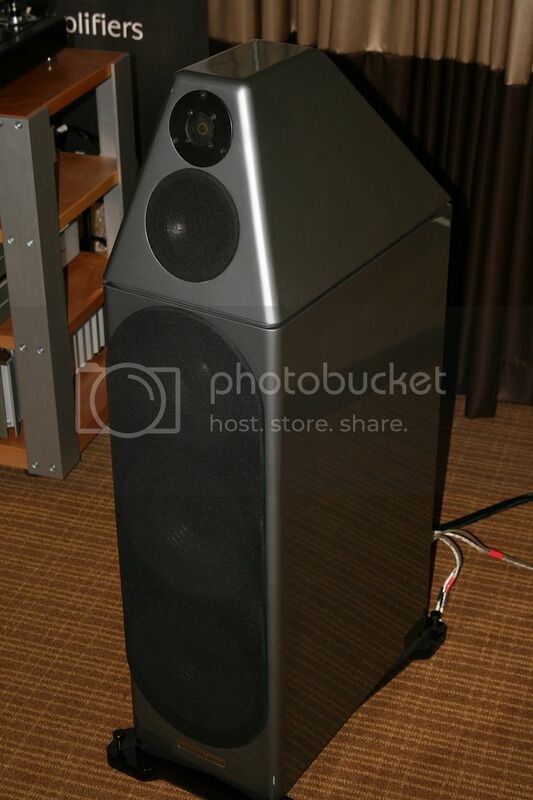 It has a stated FR of 40 Hz - 21,000 Hz with a sensitivity of 89 db and weighs 88 lbs. The room had no treatment. The cabinet had the look of a modern style finish - the silver and black made it look very elegant. They had the standard rectangle shape, but the beveled front baffle helped to give it a more refined look. The front baffle is angled to give the toed-in look without actually being toed-in which I only saw on one other speaker. They imaged fairly well, but I started out a little left of the sweet spot and could definitely localize the left speaker on the Hotel California track - the soundstage degrades noticeably off-axis. 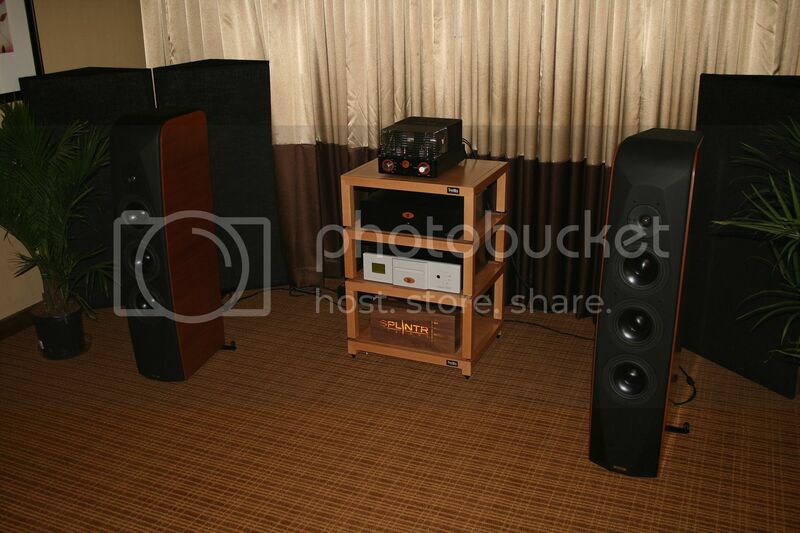 They have a very warm, full sound with good dynamic range and excellent clarity - every instrument was audible. Horns came through with flying colors - I did not feel that tensing in the shoulders I get when horns sound screechy. Mid punch was very good and low end was nice and clean. Sunday afternoon took me into the Tweak Studio room. First off, we were treated to the musical talents of Anne Bisson - you can see a copy of her Blue Mind album in the picture above. Better yet, she was there in person! She was signing autographs and had copies of her albums for sale. I enjoyed her music very much - but, of course, did not have my wallet on me so I will just have to order a copy online. Genesis Advanced Technologies is a US-based company located in Seattle. The Genesis 5.3 speaker uses two 1" Genesis HF transducer circular ribbons (front & rear), one 5" Genesis titanium cone midrange transducer, two 6.5" Genesis aluminum cone mid/bass couplers (front & rear), and three 8" Genesis ribbed-aluminum cone LF transducers. 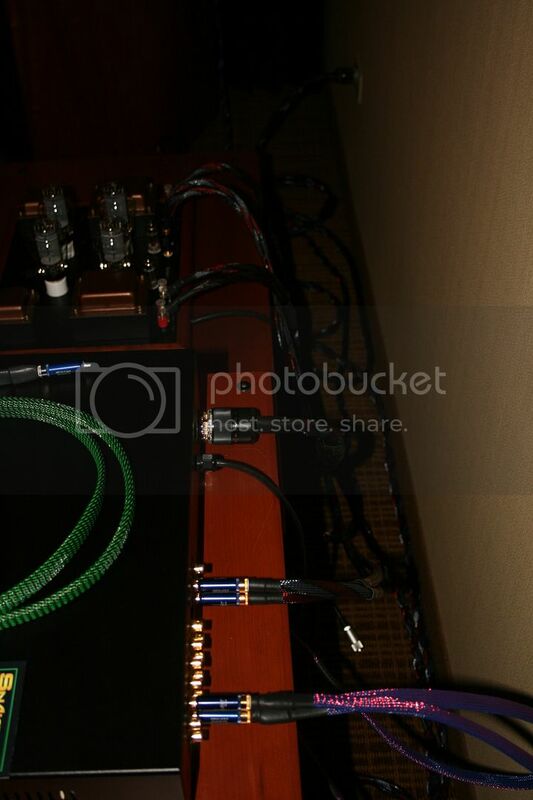 It has a stated FR of 16 Hz - 36,000 Hz with a sensitivity of 90 db and weighs 142 lbs. There was no treatment used in the room. 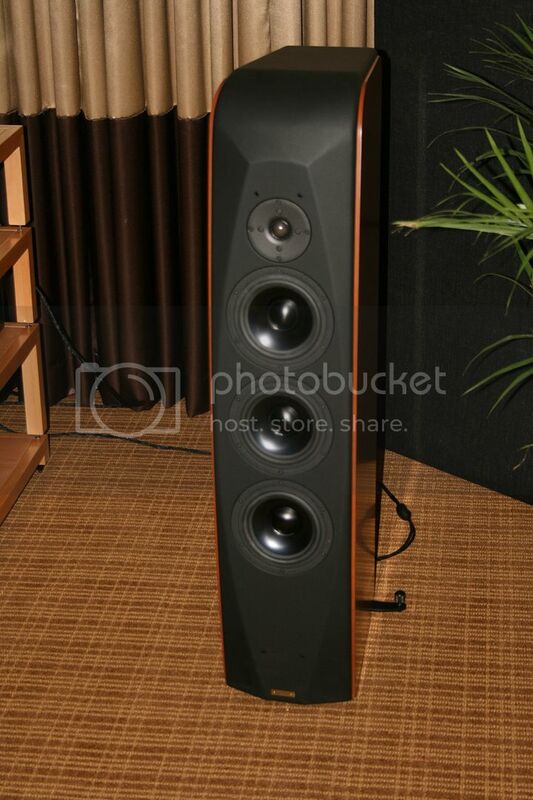 When I first saw the speakers, I thought they looked like a trash can - the top is rather disconcerting to look at. The finish is not very striking - I personally think gray is a poor choice of color as it just does not stand out - and to me, a 2 channel system is partially a show piece. What it lacked in looks, it made up for in sound. Female vocals showed great tonality and dynamic range. Clarity was fabulous - you really could hear every detail and nuance in vocal and orchestral tracks. I got up and moved around a bit (to allow someone else the sweet spot ) and discovered that they had a nice, wide soundstage - there was no noticeable degradation off-axis. Mid punch and low end were both very good as well. 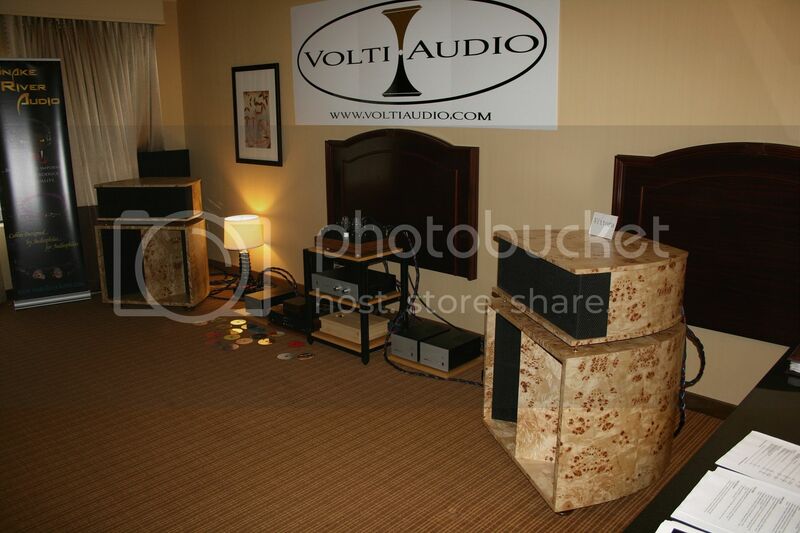 Volti Audio / BorderPatrol Audio / Snake River Audio had two rooms which I visited on Sunday afternoon. BorderPatrol Audio was originally founded in Hove, UK in 1991. 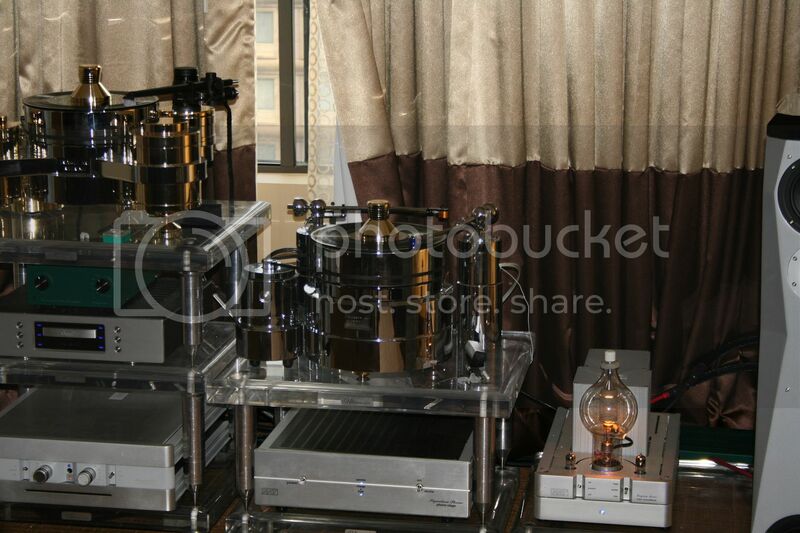 They design and manufacture tube audio electronics. In 2005, they relocated to Waldorf, Maryland. Snake River Audio is located in the US Pacific Northwest right next to Hells Canyon. Jonny Wilson was fun to talk to - very enthusiastic and has great taste in music! 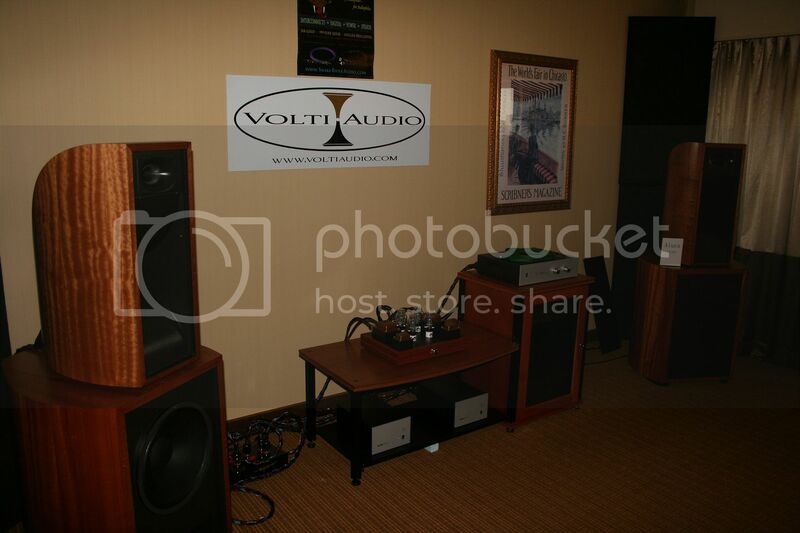 Volti Audio is located in Benton, Maine and currently offers two speakers - the Alura and the Vittora. 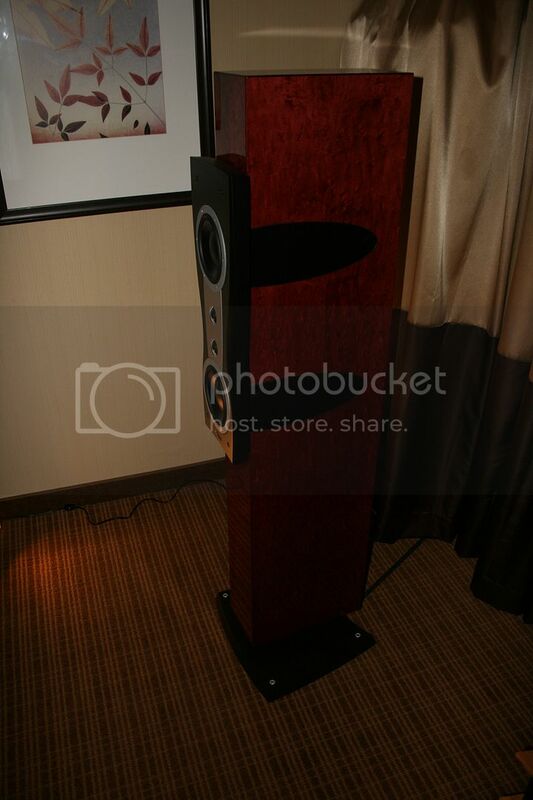 The Alura uses a 15" woofer, a 2" outlet midrange compression driver, a wooden Tractrix midrange horn, a 1" HF compression driver, and an elliptical Tractrix tweeter horn. The cabinet is baltic birch, mostly 1" thick including the 1" thick curved sides. They have a stated FR of 35 Hz - 20,000 Hz with a sensitivity of 99 db. 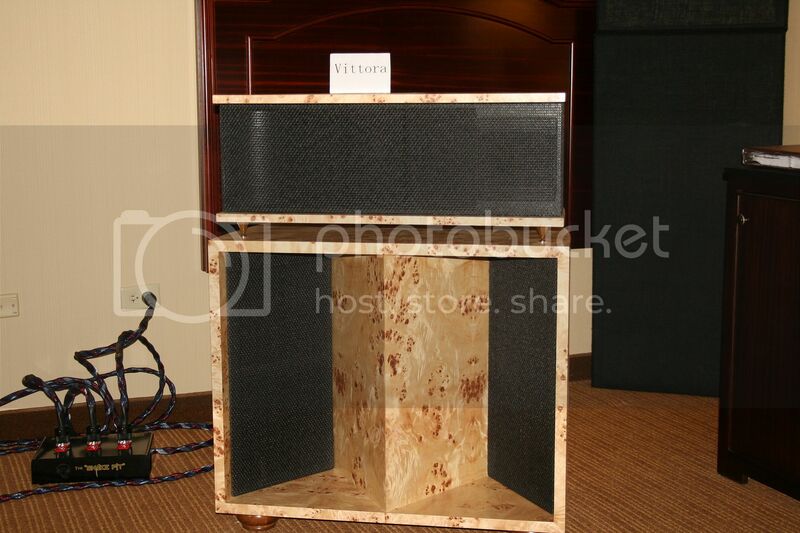 The Vittora uses a 15" woofer in a single folded horn enclosure, a 2" outlet midrange compression driver, a wooden Tractrix midrange horn, a 1" HF compression driver, and an elliptical Tractrix tweeter horn. The cabinet is baltic birch, mostly 1" thick including the 1" thick curved sides. 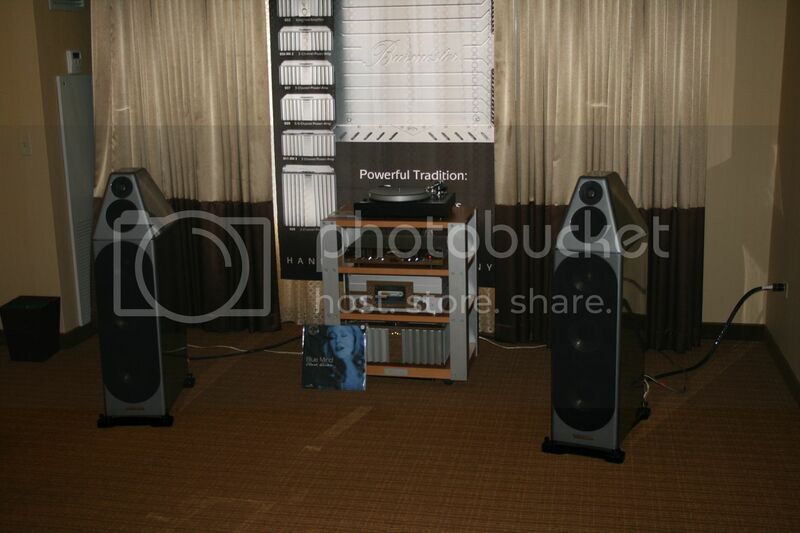 They have a stated FR of 50 Hz - 20,000 Hz with a sensitivity of 104 db. It take over 200 hours and over $6,000 in materials to build one pair. Treatment was used in the corners of both rooms. First, the Alura room - the finish and look of these cabinets was flat out gorgeous - the veneer used for this particular pair is Bosse Cedar. When I first walked into the room, Metallica was playing which made a great first impression. Of course, that also allowed me to hear the low end right away and it was [i]tight[/b] - very nice! The midrange also had a great punch and the sound was just so warm and laid back - not at all forward like I am used to from a horn. When the female vocal track started - it was a Cassandra Wilson track - the speakers just completely disappeared; they imaged so well. Then, it happened - you could hear someone's foot tapping in the track!! Just amazing detail - and the dynamic range was off the charts. Then, I went to the Vittora room - the finish on these was done in a Mappa Burl which was a bit too exotic for my tastes, but still very well done. The experience with the Vittora was pretty much the same as the Alura except the low end impact was not quite as imposing. It was these two rooms that really changed my mind permanently about horn speakers - done well, they put out utterly fantastic sound. And, with that, my fantastic weekend came to an end. Thank you all for following along on this trek - I look forward to doing it again next year! I am going to post some final thoughts in the discussion thread - let's chat!